I posted this photo over at Google+ yesterday and it got quite a response. It was shot in early May while I was visiting the wild rhododendron grove at Goose Rock. A few comments from Europe and one from the northeast US remarked that "this is something we never see." That is a point that had not occurred to me. Around here this is a sight we can see almost every day, somewhere in the area. 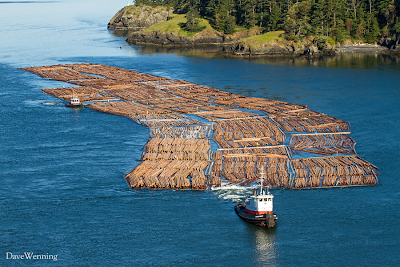 My best guess is that the logs are headed to a paper mill, perhaps in Everett, Washington. The waterway is Deception Pass and the photo was shot from out on the bridge. I had to work quickly. Those tugs and the raft of logs were moving surprisingly fast. No time for fussing with a camera. The tugboats are from Dunlap Towing in La Conner, Washington nearby. The tow boat is the Swinomish which we have seen here before. The small tender is the Pull & Be Damned. Apparently, she was named for a local road with the same name near La Conner. Or the road may have been named after the boat. It works either way. The grassy headlands in the background are Lighthouse Point in Deception Pass Start Park. You can hike there through beautiful old growth forest from Bowman Bay. It is one of the best spots to photograph the bridge. This is another photo shot a few days earlier from the same spot. The bridge is seen as a shadow cast on the waterway by the early morning sun. 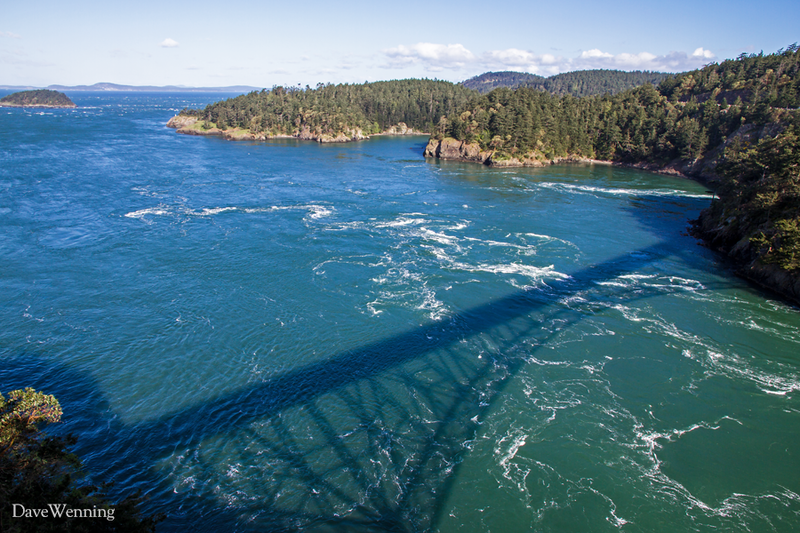 Deception Pass is famous for the turbulence created by tidal flows through the narrow waterway. Whirlpools and standing waves may be seen during swift flows. Smaller boats must sometimes wait for the tides to slacken before venturing through the pass.